This article is about the community in Michigan. For other uses, see Houghton Lake (disambiguation). 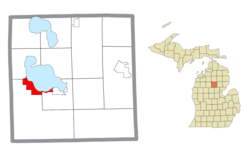 Houghton Lake is an unincorporated community in Denton, Lake, and Roscommon townships within Roscommon County in the U.S. state of Michigan. Houghton Lake is defined as a census-designated place (CDP) for statistical purposes but otherwise has no municipal autonomy. The population was 3,749 at the 2000 census. The CDP is situated on the southwest shore of Houghton Lake, which is Michigan's largest inland lake, and also includes the unincorporated community of Houghton Lake Heights. The community of Prudenville borders on the east. M-55 runs through the communities, and U.S. Route 127 passes just to the west. The Houghton Lake Area is a popular vacation spot in Northern Michigan, and is host to many resorts, events, and other tourist attractions. Tourism makes up a large part of the local economy. Houghton Lake is also a popular retirement location, with many retired residents known as "Snow Birds" who stay in Houghton Lake each year until winter. The Houghton Lake area's first white settlers were said to be the Emery family in 1873. Augustus Emery, his wife, and their 7 children left their home in Chesaning, Michigan, and made their way on foot to an area three miles south of the lake via the well-known Saginaw Trail. It was here that Mr. Emery and his three sons, Augustus, Jr., 21, William, 19, and Harvey, 17, would construct the family home on 160 acres of homesteaded property. Lumbering had a profound impact on the early development of Houghton Lake. In the mid-1800s, lumber camps in the area were abundant, and roads, towns, and railways were established to support the lumber trade. Logs were floated from Houghton Lake down the Muskegon River to sawmills and shipping facilities in Muskegon. It has been estimated that in 1860 alone, mills on the Muskegon River produced 75,000,000 board-feet of lumber. By the late 1800s, lumbering became the primary industry in the area. As lumber camps sprung up around saw mills, more settlers arrived. Around 1883, a community at Houghton Lake had been created. Houghton Lake was originally called "Roscommon Lake". However, in 1879, after the untimely death of famous physician, explorer, and Michigan's first state geologist, Douglass Houghton, Roscommon Lake was honorably renamed Houghton Lake. With the decline of the lumbering industry in the early 1900s, railways that had been used to transport lumber were transformed to passenger lines to bring outdoorsmen to fish, hunt, and experience the beauty of the "north country." The Houghton Lake fishery became legendary and attracted visitors from far and wide. By the mid-1900s Houghton Lake had become known as a prime resort area. Today, thousands of seasonal cottages, year-round homes, and businesses border the lake. Houghton Lake remains one of Michigan's top resort and vacation destinations and attracts thousands of visitors to its shores each year. In 1927, the "Johnson Dance Hall," presently known as "The Playhouse," was erected and served for many years as the entertainment center for the area. The Playhouse and the surrounding property are now home to The Houghton Lake Historical Society, as well as the yearly event "Historic Village Days"
The town was struck by a windstorm on June 11, 1932, which killed four people. During a snowstorm that caused reduced visibility, two married couples died when they drove their cars into the frozen lake on New Year's Day, 1957. The Limberlost Hotel, situated on the shore of Houghton Lake, was destroyed by a fire in 1968 causing one injury but no deaths.Two men drowned in a snowmobile accident during a carnival on the frozen lake in 1980. According to the United States Census Bureau, the CDP has a total area of 7.5 square miles (19 km2), of which 5.9 square miles (15 km2) is land and 1.6 square miles (4.1 km2) (21.49%) is water. As of the census of 2000, there were 3,749 people, 1,646 households, and 1,030 families residing in the CDP. The population density was 633.6 per square mile (244.5/km²). There were 3,057 housing units at an average density of 516.6 per square mile (199.4/km²). The racial makeup of the CDP was 97.95% White, 0.35% African American, 0.64% Native American, 0.19% Asian, 0.03% Pacific Islander, 0.13% from other races, and 0.72% from two or more races. Hispanic or Latino of any race were 0.91% of the population. There were 1,646 households out of which 23.9% had children under the age of 18 living with them, 49.7% were married couples living together, 9.2% had a female householder with no husband present, and 37.4% were non-families. 32.1% of all households were made up of individuals and 14.5% had someone living alone who was 65 years of age or older. The average household size was 2.23 and the average family size was 2.78. In the CDP, the population was spread out with 21.4% under the age of 18, 6.7% from 18 to 24, 23.3% from 25 to 44, 26.7% from 45 to 64, and 21.8% who were 65 years of age or older. The median age was 44 years. For every 100 females, there were 89.7 males. For every 100 females age 18 and over, there were 89.5 males. The median income for a household in the CDP was $27,443, and the median income for a family was $30,735. Males had a median income of $23,346 versus $16,111 for females. The per capita income for the CDP was $16,862. About 10.2% of families and 16.0% of the population were below the poverty line, including 18.6% of those under age 18 and 7.7% of those age 65 or over. Indian Trails provides daily intercity bus service between St. Ignace and East Lansing, Michigan. The Houghton Lake area is home to Michigan's largest winter festival - Tip Up Town USA, which was founded in 1951 by a group of ice fishermen, is held during the third and fourth weekends of January each year. A calendar of events is available on the Tip Up Town USA website. Some of the events in previous Tip Up Town USA festivals (many of which take place on the frozen Houghton Lake) have included a carnival, car show, polar bear dip, a giant ice slide, turkey bowling, crowning of the king and queen, pie eating contest and cross dressing contest. A weekend event takes place at the Historic Playhouse and the recreated village featuring 13 historical buildings that have been restored or rebuilt to reflect life in the logging-era of the late 1800s. A museum is housed in a hand-hewn log school house that was built in 1876. The village also features, as of August 2012, a General Store, Chapel, Cook Shack, Print Shop, Barber Shop / Pharmacy / Doctor's Office, Blacksmith, Dress Shop, Town Hall, Carriage Shop, and two homes. Historic Village Days features many events and activities, from educational to recreational. Popular events and activities include a Pig Roast, Live Music (2012's music included a dulcimer band and a barbershop quartet), Liar's Contest, Story Telling, and more. The Village is open every Friday and Saturday in June, July and August from 12-4, and Historic Village Days event takes place the first weekend in August. Shows take place on Houghton Lake Middle School grounds in Houghton Lake on various dates throughout the year. The Houghton Lake Arts & Crafts Shows features artists & vendors with a wide variety of items for sale. As of July 2013, the shows take place on weekends around Memorial Day, July 4th (the "Summer Show"), and Labor Day. Car cruises, car shows, antique, classic, and vintage vehicles, competitions, DJ, karaoke, and more. ^ "Michigan Storm is Fatal To Four". The Milwaukee Journal, June 12, 1935. p. 4. ^ "Auto Plunges Through Ice On Lake, 4 Die". The Spokesman-Review, January 2, 1957, p 2. ^ "Fire Razes Hotel At Houghton Lake". The Toledo Blade. September 3, 1968. p. 15. ^ "Bodies of drowned snowmobilers recovered from Michigan lake". Lakeland Ledger, January 27. 1980, p 4A. ^ "NowData – NOAA Online Weather Data". National Oceanic and Atmospheric Administration. Retrieved 2018-03-02. ^ "MI HOUGHTON LK ROSCOMMON AP". National Oceanic and Atmospheric Administration. Retrieved 2018-03-02. 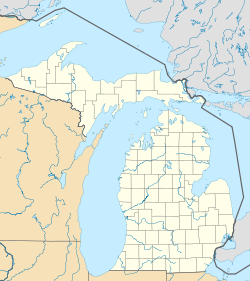 ^ "EAST LANSING-PETOSKEY-ST. IGNACE" (PDF). Indian Trails. January 15, 2013. Archived from the original (PDF) on June 29, 2014. Retrieved 2013-02-27. ^ Spencer, Catherine (January 18, 2010). "60th Tip-Up-Town USA in Houghton Lake, Michigan Winter Festival Fun". Yahoo Contributor Network. Archived from the original on October 22, 2013. Retrieved October 21, 2013. Carman, Bulah. Capsules of Time: A Saga of Houghton Lake. Houghton Lake, Mich.: Bankov Printing, 1987. Wikivoyage has a travel guide for Houghton Lake.